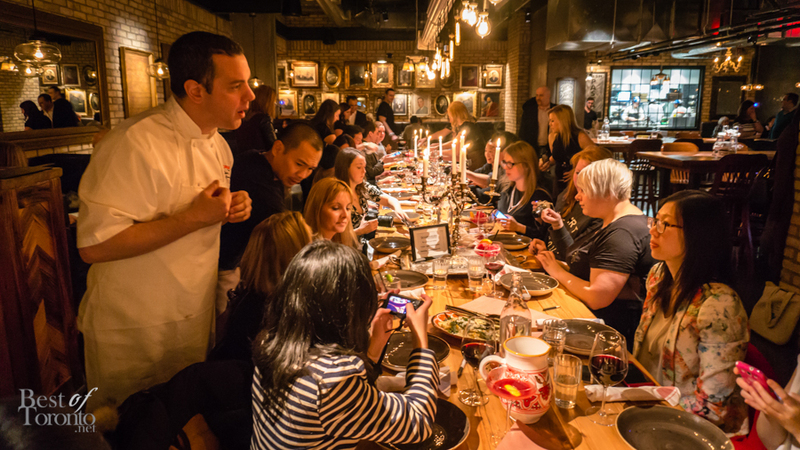 On February 27, Scaddabush Italian Kitchen and Bar, from the SIR Corp family of restaurants, hosted a media dinner to introduce their newest location at Yonge & Gerrard. When you first walk in, you can’t help but feel welcome. The exposed brick and ceilings, the wood and marble materials, and the ornately framed “old world” art, all lend to a vintage feel. 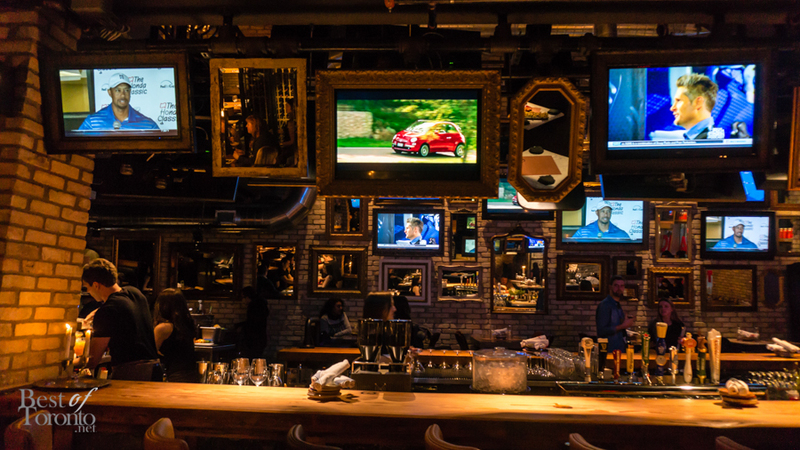 But there are modern touches too – metal accents, large screen TVs cleverly placed in some of the frames, and filament light bulbs that emit a warm glow. The music is also modern, but not overly loud, with the acoustics just right so that you can comfortably converse with friends. Together these elements create an ambience that makes you feel at home, hence the “Italian Kitchen” in the restaurant’s name. It’s at the bar where the night started. Three dishes were served – Calamari, Chicken Parm Bites, and Pappardelle Chips – the last of which was my favourite with its unexpected combination of spicy and sweet. I also sampled a few of the specialty drinks, including the Vespa Thief – a sweet blackberry/lemon/vanilla cocktail, and the Mango Sting Margarita – a distinctively spicy concoction. 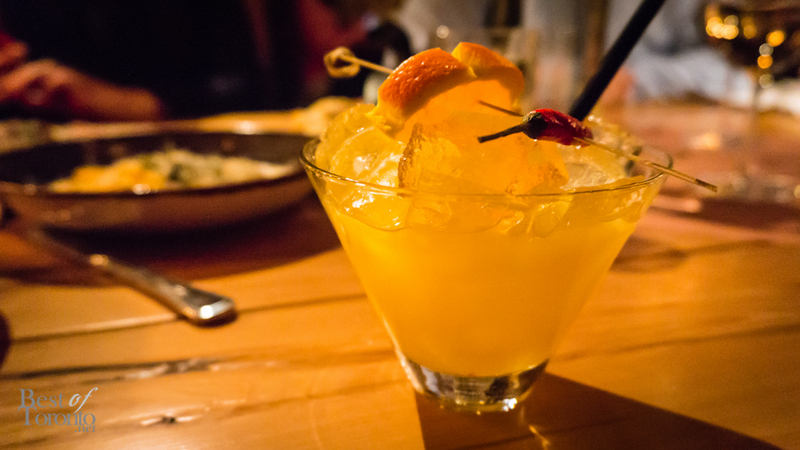 The drink menu has a generous selection of wines, sangrias, and cocktails, including a barrel-aged Negroni. 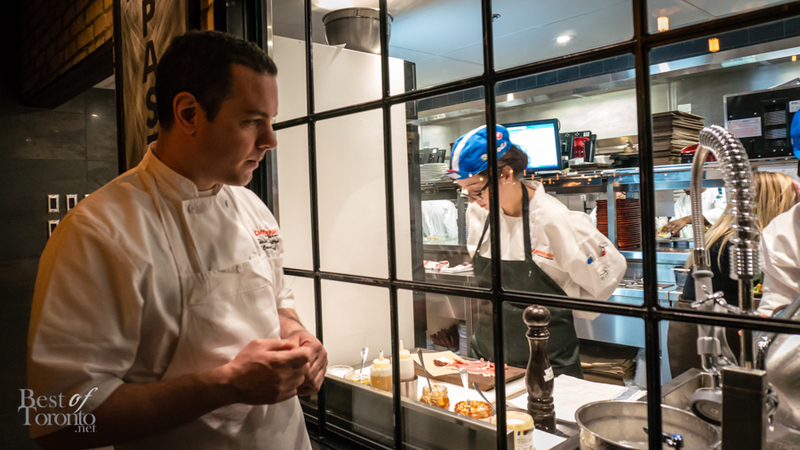 During cocktail hour, I wandered over to the back of the restaurant where one literally had a window into the kitchen. Executive Chef Steve Silvestro explained that all of the mozzarella they serve was freshly made, and I was able to watch this first-hand. For dinner, we moved to a separate section where long, inviting farmhouse-style tables awaited. For appetizers, there were various salads and bruschettas, and mozzarella served three ways – naked, with proscuitto, and as a buratta. What’s a buratta, you ask? It’s a fresh mozzarella ball stuffed with a butter cream and drizzled with honey and truffle oil. If you’ve never had fresh mozzarella, this is a must try. 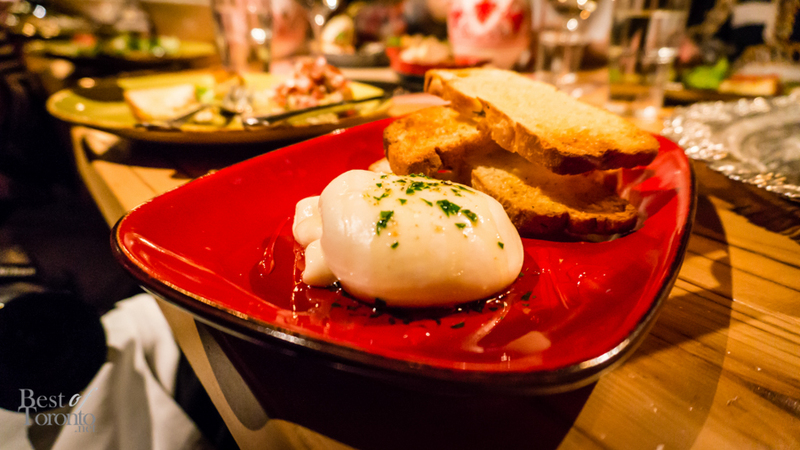 The burrata’s soft creamy texture was a perfect complement to the golden, toasted crostini. This was without a doubt my standout dish of the evening. The famous Scaddabush meatball (top image) was another delicious dish. Served as classic, or stuffed with pepperoni and mozzarella, these half pound Certified Angus beef creations were flavourful and moist – everything you want a meatball to be. 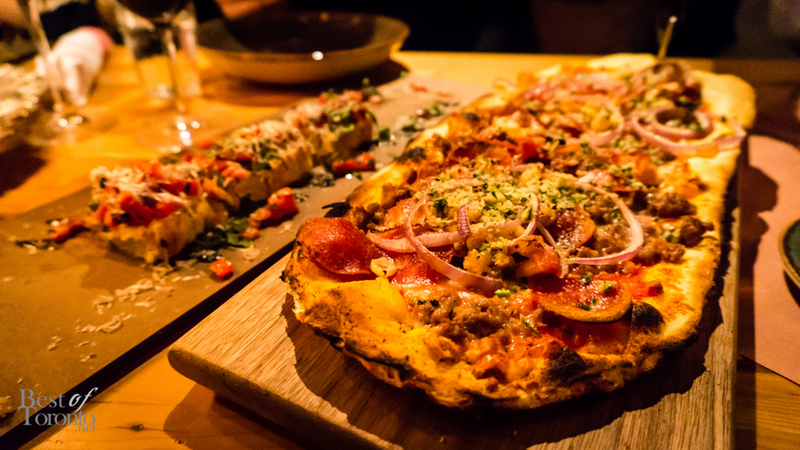 These appetizers, like most of the dishes of the night, are meant to be shared and thus served homestyle, emphasizing the social Italian kitchen feel that Scaddabush is all about. After the appetizers, the food just kept coming. There were four different types of pizza, catering to carnivores and vegetarians alike, and everyone else in between. There were also four different pasta dishes, with the Scaddabush meatball making another appearance, this time on top of spaghetti. 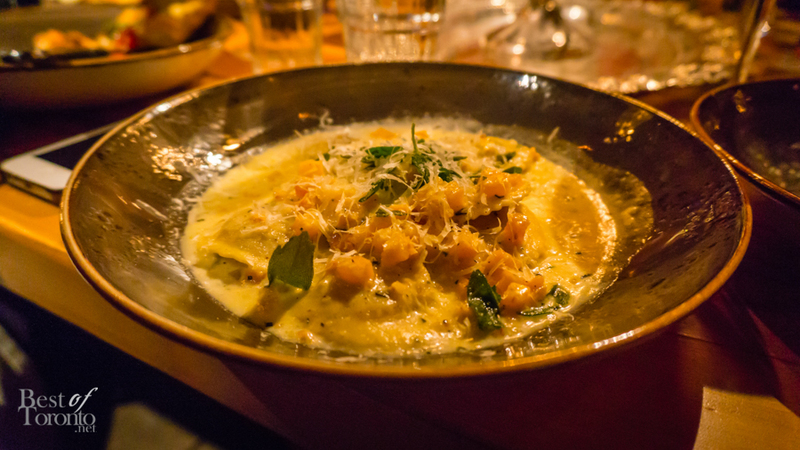 Of the mains, my favourites were the Butcher pizza, (just because I love meat, and there was lots of it), and the Ravioli Zucca – whose sweet butternut squash filling worked harmoniously with the salty, freshly grated Grana Padano cheese. Dinner was capped off with a trio of desserts. The apple ravioli came with a caramel sauce and a scoop of vanilla ice cream. 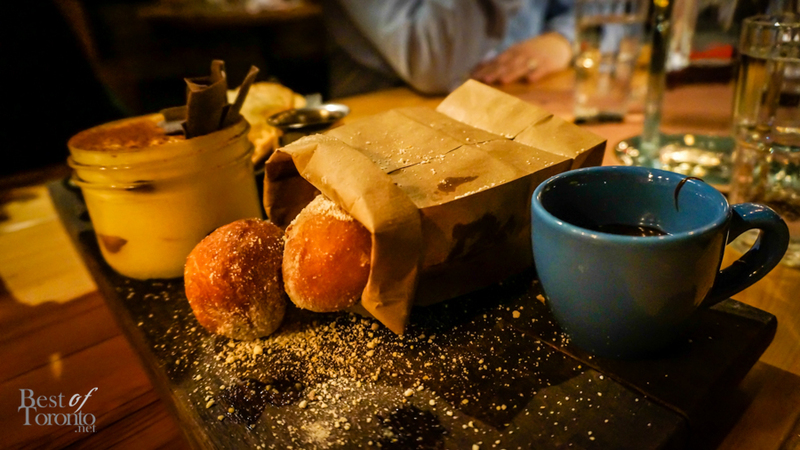 The zeppole – Italian style doughnuts – were dusted with icing sugar, and charmingly served in a brown paper bag. These are meant to be dipped in the accompanying chocolate hazelnut sauce. Finally, there was tiramisu, which achieved just the right balance of sweetness, firmness, and creaminess. With a cup of cappuccino in hand, this was the perfect end to a great dinner. Scaddabush Italian Kitchen and Bar succeeds in retaining the hallmark of authentic Italian cuisine – fresh, simple ingredients in traditionally prepared dishes – but in doing so, still manages to surprise with some modern twists. Along with friendly, attentive service, and the warm, cozy atmosphere, everything comes together in this welcome addition to the College Park neighbourhood. Definitely worth a visit if you’re in the area. Scadabbush is located at 382 Yonge St., facing Gerrard St, at the street level of the Aura condominiums. New Video: The Argos Cheerleaders lip-dub to Nicki Minaj's "Starships"